Corbett delivers a masterpiece! It goes deep and ties it all together. This could easily be a 20-40 hour documentary full of many examples and details. He does a superb job of presenting a synopsis of the situation. The information presented in this fantastic documentary is directly related to 9/11/2001. The invasions into the middle east with its oil reserves are intimately tied to 9/11. If oil was not the "king commodity", perhaps there never would have been a 9/11. Oil is the most heavily traded commodity. It is my contention: If oil as a "king commodity" is destroyed, then the oligarchs would start to lose their stranglehold. If alcohol (as originally envisioned) had become the major fuel back during Ford's time, being freely produced by anyone at will, then things would be quite different now. With the recent very low oil prices, we see the EXACT playbook which Rockefeller used in gaining his empire during the early days. I speculate that part of the agenda is to crush the small guys (and then buy up their resources) along with dynamically suppressing the economies of a host of other countries. TomT on Thu, 12/31/2015 - 1:10pm. There are some videos at the CorbettReport which are only available to subscribers. (It is cheap to subscribe) Some of these videos tie in well to the above documentary. Below are a few of his well known YouTube videos which blend with "How Big Oil Conquered the World". TomT on Thu, 12/31/2015 - 1:50pm. Oil and 9/11: Crossroads of Corruption and Criminality on "Guns and Butter"
James Corbett's two documentaries are discussed, beginning with How Big Oil Conquered the World; the rise of the oiligarchy; the Yom Kippur War and subsequent 1973 oil shock; petro dollars and the monetary system; the creation of modern education, medicine, the green and gene revolution; control of the food supply, and the interrelationship of the global petrochemical industry with all of the above. 9/11 Trillions: Follow the Money is analyzed as a crime and follows the money through the Silverstein heist, the secret heist of Marsh & McLennan, et al., put and call option insider trading on many corporations; and the Pentagon's missing trillions. TomT on Sat, 01/09/2016 - 8:27am. James has created a new YouTube Channel which has some of his podcasts and audio. The following quick clip is worth listening to. James Corbett talks about getting information, about pundits and people who may advocate certain "truths" but perhaps deny "9/11 Truth", and about "Leaders in the Truth Movement". James brings to light a balanced perspective. TomT on Sun, 01/24/2016 - 7:36am. And his Japanese is evidently very good! btw, I've traveled to Japan a dozen times for scientific work, and find them to be a respectful and diligent people to work with. Rockefeller and other key players who made their fortune in the oil business have taken over and now control education, medicine, the monetary system, and the food supply, in a quest to monopolize all aspects of life "
ProfJones on Thu, 01/28/2016 - 6:20am. "How Big Oil Conquered the World" on the well known Dr Mercola website! That is really great to hear! I know you, I, and many, many others love reading Dr Mercola's articles. TomT on Thu, 01/28/2016 - 11:28pm. NOTE: Months prior to the release of the Corbett Report "How Big Oil Conquered the World", the following email write-up was circulated to Dallas area groups because it also has local links and maps. The write-up jives well with Corbett's documentary. Oil – Some things which many people do not know. Actually, the real story here is not just about oil, but it is about a grass roots movement which any person can do right now. The real story becomes a solution and objective towards destroying Monsanto; creating millions of good paying American jobs; creating organic and non-toxic food in abundance at low cost; cleaning up our air and water and waste without added effort or expense; and a long list of many other great benefits. However, in accomplishing the objectives stated above, we have a waste product. The waste product is alcohol which easily can be used to power all the current cars instead of gasoline. Alcohol also easily can fuel many aspects in the home, industry and business. The net cost per gallon is about $1.00, sometimes a little more and sometimes much less, depending upon the situation. Depending upon the goal and purpose, often alcohol literally costs nothing because it is the “waste product” or an easily acquired side product. Some examples of goals or objectives: organic “permaculture” agricultural applications for plants and animals; production of a natural weed killer and fertilizer; production of a high quality animal feed; fish or crawdad farming; high yield greenhouse production; sewage waste treatment techniques and also water run-off cleanup technology or ocean cleanup technology. Running a car on alcohol literally cleans the pollutants from the atmosphere (i.e. the exhaust often becomes cleaner than the air from the intake). Alcohol fuel gives much longer life to the engine than gasoline. The manufacturing of alcohol NEVER reduces the potential food supply, but only aids in more food production. Alcohol trumps gasoline as a fuel in so many ways, that the list is too long to place here. With relative ease, an individual or small community or large city or country can manufacture alcohol. Brazil currently does not import oil because it bases its fuel economy on alcohol. The production of alcohol can be scaled to the needs of the people involved. In the city, alcohol can cheaply be made from such waste products as old donuts and bread, or from a grocery store of which tons of rotted produce is thrown out monthly. The best plant to grow for the direct purpose of making alcohol is the plant that is best suited for the climate and soil conditions of the area. Example of plants for arid conditions: Mesquite trees, prickly pear cactus, agave, buffalo gourd, etc…. all of which outperform corn alcohol production by about 2 to 1. And the real story here also includes the destruction of an oil based economy. It is my contention that if oil was eliminated as the dominant fuel (and dominant synthetic chemical source), then the “Powers That Be” would lose their grip in manipulating the world. I contend that the first major step in regaining our freedoms and quality of life is the destruction of Big Oil. Many other corrupt activities, such as The Federal Reserve, would fall like dominoes. Brief History on how Oil and Gasoline became so important. In the era prior to the light bulb, most people used Kerosene for lighting in their homes. Rockefeller started his empire from this marketplace. In the 1860’s, John D. Rockefeller started in the oil refinery business. Whale oil was too expensive for the masses. Kerosene became the new replacement. During this time period, Rockefeller dumped gasoline into the rivers as a waste product, because it would explode in a kerosene lamp. There were times when the river caught on fire. J. D. Rockefeller was ruthless in his quest to dominate and monopolize the oil industry. There were many independent oil companies and refineries which later fell prey to the covert Rockefeller dealings. Rockefeller formed a secret cartel with railroad freight companies and some other oil companies in order to underprice his competition. He either bought out his competitors at below market prices (including bankruptcy auctions) or extorted them to join his cabal. Some other methods he used to destroy other companies included buying up all the chemical supplies needed for refining, or buying up all the barrels needed for shipping, or gaining control of all the tanker railroad cars so no one else could ship their oil. Standard Oil (formed in 1870) added its own pipelines, tank cars, and home delivery network. It kept oil prices low to stave off competitors, made its products affordable to the average household, and, to increase market penetration, sometimes sold below cost if necessary. It developed over 300 oil-based products from tar to paint to Vaseline petroleum jelly to chewing gum. (Sidenote: Much of the current bubblegum is actually plastic.) By the end of the 1870s, Standard was refining over 90% of the oil in the U.S. The monopoly of Standard Oil was broken up into 34 new companies. Rockefeller gained tremendous wealth and stock profits as a result of this government anti-trust action. He now also controlled huge portions of stock in all these companies. Standard of Ohio, which became Sohio, eventually becoming part of BP. By around the 1890’s, America was starting to see electric lighting and a power grid starting to develop. This changed the economic landscape for the future of Kerosene as a “light source”. It was a threat to Rockefeller’s Oil Empire. During this era, Henry Ford came out with the first affordable cars for the average American. The original cars (Model T – introduced in 1908) were designed to be run on ALCOHOL (whisky or what-have-you)(ethyl alcohol also called ethanol). A HUGE dilemma with this introduction of cars was the fact that “no infrastructure” existed for fuel. Henry Ford had it all worked out, because most of America’s population at that time had farms. Many farms already had stills with which to make alcohol. Alcohol was easy to make from all kinds of things ( e.g. corn, apples, fruits, grains, potatoes, beets, turnips, etc.) Thus, Henry Ford had the “problem of fuel infrastructure” solved. The average Joe could make their own fuel, and/or sell alcohol to people who had cars. Prohibition eventually came into effect at the start of 1920 as a result of, not a simple Federal Law, but a Constitutional Amendment. Prohibition was instigated as a Covert Operation by Rockefeller. He financed it with huge sums of money for this era, funding organizations like the Women's Christian Temperance Movement. Remember…women did not vote. Congress was almost entirely male, and most Congressmen drank. Many people did not really want to outlaw alcohol. Rockefeller financed a PR campaign to “evil-ize” drinking alcohol. Prohibition lasted from the beginning of 1920 until December 1933. It had the net effect of taking alcohol out of the marketplace as a fuel source. Germany for the most part used alcohol as a fuel prior to and during WWII. Japan ran its airplanes on alcohol. The Covert Destruction of a wonderful Public Transit System including electric trollies and electric rails. …and also the Covert Agenda to build roads and highways. Following World War II up to the 1960’s, General Motors, Standard Oil, Mack Truck, Firestone, Phillips Petroleum all got together in a conspiracy (later proven in Federal Court, but the culprits were fined one dollar). This cabal formed some corporations which bought up all the trolley companies. After deliberately running these trolley companies into the ground, destroying their viability, the trollies were burned in public bonfires or “dumped” and the rail tracks were pulled up. Later, another cabal was established to also destroy or inhibit good service with the bus system. Thus became the beginning of the roadway system which we have today. 1979 – Long gas lines at the pump with service stations running out of gas. The “stated reason” for the high price of gas and short supply was that the Shah of Iran (a puppet for the United States) was replaced by the Ayatollah Khomeini who then also cut Iran's oil production. During this period, the United States government started incentives for alcohol gas production. The foremost world expert on homemade alcohol production, David Blume (who once previously worked with NASA and also for Mother Earth News) had major portions of a “do it yourself” book about alcohol production at the press ready for printing back in the early 80's. He had also spent years making a film series for PBS. However, the PBS documentary was cancelled at the very last minute by the oil giants after airing only a few shows. The original 1983 printing of the book was also squashed. The cartel also crushed David Blume financially at that time. He was lucky enough to eventually retain the rights to his book after many legal battles. Today, the book is more revised. “Alcohol Can Be A Gas” by David Blume – A 600 page book with graphics and DVD. The famous Buckminster Fuller, wrote the foreword to the book in 1983: that alcohol (or ethanol) is a renewable variety of solar energy in liquid form, the cultivation of which can enhance soils, be used as a minimally- or non-polluting fuel, and enable farmers and individuals at large to make fuel locally. The most powerful Public Relations firm in the world is the American Petroleum Institute (API). Many myths exist about alcohol as a fuel all because of their PR firm. All of today’s cars will run on a mix of alcohol and gas. No adjustment is needed. Most current cars can easily take 30% or more alcohol in their fuel tank. The Flex Fuel vehicles will run almost exclusively on alcohol. A person can convert their vehicle to a Flex Fuel vehicle in a simple 7 minute (anyone can do) installation of a gadget which costs between $250-$450. General Motors purposely designed their Flex Fuel cars to run inefficiently. This was discovered by people who understand the computer software which the car uses. It is my contention that the current 2015 low prices of oil are by design. The agenda is to wipe out the small guys both domestic and foreign, to wipe out some alternative fuels, and to damage the economy of other countries. In the late 1980s and 1990s, a so-called “oil surplus” drives gasoline prices down as low as $12 per barrel, driving most of the ethanol (alcohol) industry into bankruptcy. The lie surrounding the 1973 Oil Crisis. The Covert Destruction of the Public Transit System and the Covert Agenda to build roads and highways. Watch this video. Most people (even conspiracy experts) are unaware of this conspiracy. One Hour VIDEO - "Taken for a Ride"
This film is a bit more “conventional”, but yet has some good aspects. TomT on Mon, 02/08/2016 - 4:21am. "...Saudi Aramco, which handles the marketing of Saudi Arabia’s crude, is the successor to the Arabian American Oil Company, a partnership between Chevron, Texaco, Exxon and Mobil established in the 1930s and 1940s. Chevron (which later acquired Texaco) and Exxon (which acquired Mobil) remain some of the largest importers of Saudi crude into the US, according to customs records. In 1988, Saudi Aramco bought a 50 percent stake in Texaco’s refining and marketing operations in the eastern US and on the Gulf Coast, which was named Star Enterprises (“Saudi Arabia, Texaco join forces” Los Angeles Times, 1988). In 1997, Royal Dutch Shell joined the joint venture, subsequently renamed Motiva. When Chevron merged with Texaco in 2001, Texaco’s interest in the combined refining and marketing operations was sold to Shell and Saudi Aramco and reorganized as a 50:50 joint venture between them. Motiva operates three large refineries in Louisiana and Texas (Convent, Norco and Port Arthur) with a combined refining capacity of 1.1 million bpd. Motiva also as a network of refined product storage terminals across the eastern US ..."
How Saudi Arabia successfully defended its US oil market share by John Kemp - Reuters market analyst. LONDON: Saudi Arabia has successfully defended its share of the US oil market even as rising domestic production from shale and growing pipeline imports from Canada have cut seaborne imports from other countries. Saudi crude exports to the US have remained relatively constant at around 1.2 million barrels per day since 2009, even as tanker arrivals from other countries have halved from 6 million to 3 million bpd. Saudi Arabia has have defended its market share through a combination of luck, strategic relationships and skilful marketing, a model the kingdom is now seeking to replicate in fast-growing fuel markets such as China. Saudi Arabia has been fortunate in that the oil produced from shale is not in direct competition with its own crude exports. Shale oils are very light with a density of only 780-825 kg per cubic meter. The crude Saudi Arabia exports to the US is much heavier, with an average density of around 860 kg per cubic meter. Refineries are highly selective about the crude they process since it has a big impact on how efficiently and profitably they can operate as well as problems with equipment fouling and product quality. Most US refineries have therefore opted to make space for increasing shale production by cutting the amount of other light crudes they buy from countries in West Africa and Latin America. Imports of medium and heavy crudes from Saudi Arabia and other countries around the Arabian Gulf have not been affected to anything like the same extent. Saudi Arabia’s oil exports have also been protected by the long-standing strategic relationships the country has with refiners and marketers in the US. Saudi Aramco, which handles the marketing of Saudi Arabia’s crude, is the successor to the Arabian American Oil Company, a partnership between Chevron, Texaco, Exxon and Mobil established in the 1930s and 1940s. Motiva also as a network of refined product storage terminals across the eastern US and markets gasoline, diesel and other refined products in 26 states and the District of Columbia under the Shell brand as well as through unbranded wholesalers. Motiva’s refineries have been optimized to run on the medium-density crude oils Saudi Arabia exports, and the joint venture remains one of the largest importers of Saudi oil, according to the US Energy Information Administration. Saudi Aramco is hoping to replicate the same sort of strategic downstream integration in China’s fuel market. The company’s chairman said recently that Saudi Aramco is in advanced talks to invest in refineries in China and the company is also in talks with CNPC and Sinopec about joint investment opportunities in refining, marketing and petrochemicals. Saudi Aramco has also defended its market share through skilful and competitive marketing of crude to independent refiners in the US, including Valero, Phillips and PBF Energy. Aramco prices competitively via monthly adjustments to official selling prices linked to regional benchmarks designed to protect market share and target sales volumes. The company also stresses its importance as a reliable supplier and strategic partner for refiners. Unlike some rivals, Aramco does not rely on the spot market to place its oil. Exports are almost all sold to refiners on term contracts and protected by destination clauses which limit secondary trading in Aramco crude. Historic ties, downstream integration, strategic marketing relationships and competitive pricing have all helped Saudi Arabia to maintain its share in the US market, which is important for both commercial and political reasons (“Texas refinery is Saudi foothold in US market,” New York Times, 2013). The company has also benefited from a good dose of luck in that its crude is quite distinct from shale, a good fortune that has not been shared by producers in West Africa. Saudi Aramco has similar strategic ties to refineries in Japan and South Korea. Now it wants to build them in China as well to protect the company’s long-term future. The importance of these relationships is one reason why Saudi officials continue to stress their determination to protect their market share and refuse to cut production to support prices unless rivals follow suit. Russia, Iran and Iraq are the most direct competitors for the crude grades that Saudi Arabia markets so their willingness to match output cuts as part of any agreement is a priority for the Kingdom. TomT on Mon, 02/15/2016 - 5:53pm. 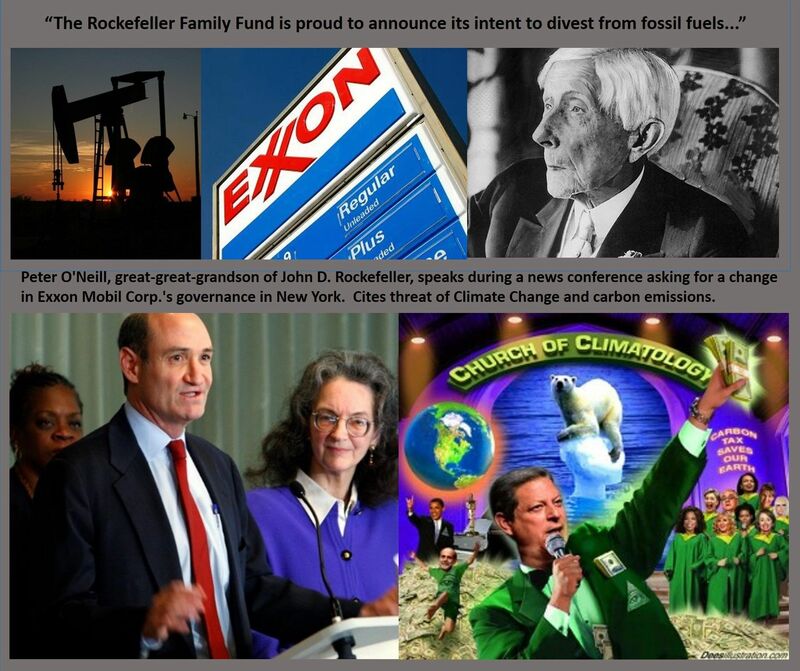 The Rockefeller Family Fund is proud to announce its intent to divest from fossil fuels. The process will be completed as quickly as possible, as we work around the complications of modern finance, which is increasingly dominated by alternative investments and hedge funds. While the global community works to eliminate the use of fossil fuels, it makes little sense—financially or ethically—to continue holding investments in these companies. There is no sane rationale for companies to continue to explore for new sources of hydrocarbons. The science and intent enunciated by the Paris agreement cannot be more clear: far from finding additional sources of fossil fuels, we must keep most of the already discovered reserves in the ground if there is any hope for human and natural ecosystems to survive and thrive in the decades ahead. We would be remiss if we failed to focus on what we believe to be the morally reprehensible conduct on the part of ExxonMobil. Evidence appears to suggest that the company worked since the 1980s to confuse the public about climate change’s march, while simultaneously spending millions to fortify its own infrastructure against climate change’s destructive consequences and track new exploration opportunities as the Arctic’s ice receded. Appropriate authorities will determine if the company violated any laws, but as a matter of good governance, we cannot be associated with a company exhibiting such apparent contempt for the public interest. To operationalize this decision, the Board has instructed its advisors, effective immediately, to eliminate holdings of ExxonMobil, and all coal, and tar sands-based companies outside the portions of the portfolio managed by third parties, and to keep exposures for these three categories of investment below 1 percent across the entire portfolio. The Family Fund’s Finance Committee will soon be entering the second phase of its divestment work, which will entail seeking suitable alternatives to certain commingled funds now held. The field of Socially Responsible Investing is dynamic and growing and we are confident that a variety of options will soon emerge for mid-sized endowments such as ours. Needless to say, the Rockefeller family has had a long and profitable history investing in the oil industry, including ExxonMobil. These are not decisions, therefore, that have been taken lightly or without much consideration of their import. But history moves on, as it must. Indeed, it is past time for all people of good will to do everything in their collective power to make our new path one that recognizes the deep interdependence between humanity’s future and the health of our natural systems. ...“It’s not surprising that they’re divesting from the company since they’re already funding a conspiracy against us,” Alan Jeffers, a spokesman for Irving, Texas-based Exxon, said in an emailed statement on Wednesday. ...Here is the best part: this whole “divestment” is nothing more than theater. This specific endowment runs a tiny $130 million in total assets. As for Exxon, its shares were down 0.4% on the day, less than the drop of the broader market. So here is the real question: will the Rockefellers divest of their full energy holdings, kept in blind, family, and various other (offshore of course – nobody wants to pay taxes, not even green liberals) unknown trusts, due to their disgust with the “morally reprehensible” company created by their ancestor? The answer: of course not. TomT on Fri, 03/25/2016 - 8:13am. In August 1974, Richard Nixon resigned as President of the United States of America and Vice President Gerald Ford ascended to that position. One of Ford’s earliest responsibilities was to nominate a new Vice President of the country: and he named Nelson Rockefeller. This led to a series of hearings in the Congress, before his ultimate confirmation. Those Congressional hearings provided a significant opportunity for public exploration of an old philosophical question: What is the true and proper role of private family wealth in this avowedly democratic nation? None could be more relevant than the family of the Rockefellers. The original John D. Rockefeller, a business genius active from the late 1800’s to the early 1900’s, created the (in)famous Standard Oil Company and became the icon of American capitalism, to be revered or damned by later generations. TomT on Mon, 05/02/2016 - 10:45pm. 5/3/16-ZeroHedge- Central Banks Manipulating Oil Market? Therefore, it should not seem like any big conspiracy theory, when you see total nonsense pricing (bad news is good news) in the oil market to ask, are central banks now moving on to doing the same thing in the oil market? Why wouldn’t they? 1) What’s to stop them? 2) Clearly US banks that are members of the Federal Reserve System are being hurt by the oil price war, so the Fed can justify this as another “intervention” they need to do to save their own banks from collapsing due to bad loans throughout the oil industry. ... Over twenty billion of bad debts — most of it in oil companies! That number beats many of the big bankster bailouts during the worst of the Great Recession for size. That’s just one major bank, and those are only the loans the banks is showing as bad. How many other loans does JPMorgan have that are not in some stage of default but that are with oil production companies that are sinking fast? TomT on Tue, 05/03/2016 - 9:31am.